January and the start of another exciting year. 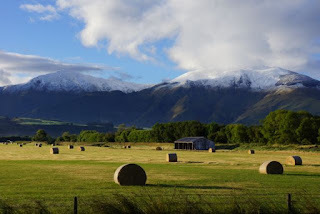 I have just sent out the January newsletter to all of you and I hope you enjoy it. 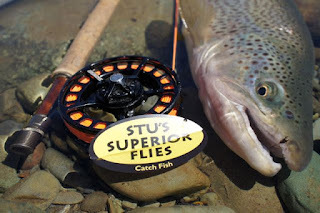 It has again a great special offer for readers in it, fun, fishing info and some great photos of HUGE trout that have been caught,all on my Superior Flies - wow! It's an honor to know these fish have been getting caught on my fly designs. Only the best strongest light wire hooks are used! 90 % of flies sold in most shops are on cheap hooks! And the flies cost the same? Be safe this summer! If you want to get even more great news and information from the coolest fly shop in the world - please sign up today. It's quick and easy to do and most of all it's FREE. Well - this year has been very busy with many return clients arriving back for some more good times. Long may it continue. Mark and Di were back for a week of great fishing at the start of November. Mark left on a high by catching a huge trophy brown trout something we had been working on for a few seasons now. It's great for client and guide when a plan eventually comes together. One of the problems guiding them both is that I end up with sore jaws from laughing with them both even though we are very serious when we are out there. 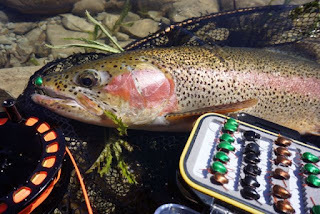 The fishing has been on fire and it was great to see in the last few weeks the trout freely rising to dry flies. Small deadly blow flies were working great but the pick of the bunch and the most productive fly would have had to be my deadly hi-viz ant. Although there is no ants around at the moment there is plenty of dead saw flies floating down most river systems - that's the flies that hatch from the willow grubs. Willow Grubs also started last week on the upper Mataura and other Southland rivers. 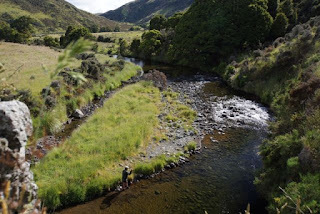 Normally the grub action will start in the upper sections of the willow lined rivers, though this year my Gore customers on the lower Mataura were using and catching many trout well down past Gore for the past three weeks. 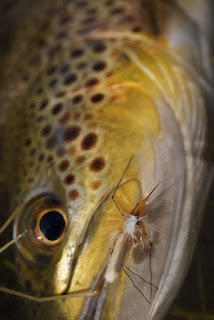 That small grub fly on the smallest strongest tmc hook never seems to stop amazing me. Still strange after all the years my design has been available that some people have not even tried it and give up at the sight of willow grubbing trout. Within a week of the grubs starting to fall the phone was red hot with all the local and New Zealand / Australia top guides after dozens of them. The other day Ela was in the shop as I was out busy guiding. Soon she had three fishermen asking her if they could borrow the phone to call the guide and see if he could come and pick them up. The guide had lost them and they were not too happy, after a few calls and 40mins the guide arrived and I don't think that would have been a pleasant drive back for him back to the city. This has happened in the past that I have had to help clients that have been left behind by a guide. This should never happen and if you do you homework when hiring a guide it will never happen! A range of Deadly Daddy/Damsel/Dragonflies!!! The hot spell we just had was great. The top selling and most productive still water / backwater fly was the hi-viz deadly Daddy fly- which room the underneath also looks like a damsel fly. 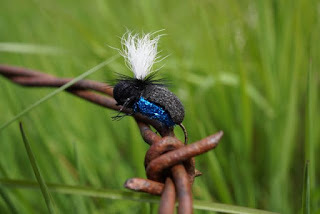 Many lake edge fly fishers have been having great results using them. So get some of these in your box soon as I do not have many left in stock. The deadly Daddy/Damsel Nails fish! The other day two people came into the shop again to burn Ela's ears off about a guide jumping right in front of them on a semi remote small river that has a road beside it. They were not far from him and he saw them as they waved in dismay letting him know that they were working upstream, the guide was yelling back F### ##F and waving his fist. Just before the rains the beetles were out, and so was my beetle guiding box. Their is no need for this as their is plenty of water around. 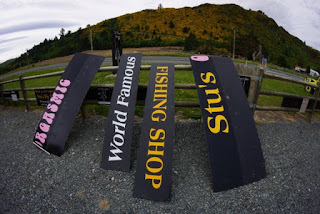 The guys were there first and in NZ if they are moving upstream you fish behind them or go else where, it's sad to hear that this attitude was taken when he obviously stop and read the note on their car and could see them, before going in front. Lucky they were nice guys and did not go up to his car and client, as one of them was a black belt. The hot spell over the Christmas break had everybody with time on their hands a chance to go fishing and out they all were. Most people were lucky enough to catch at least one fish - guided and unguided. 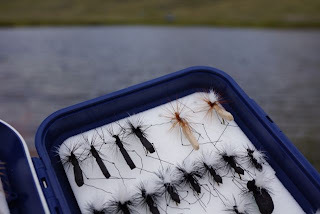 The stories of the big ones that got away were many and a few were lost due to broken hooks, flies that seem to be always bought from the same online stores. Stu's Deadly HI-VIZ Nz Blowfly- notice the large gape hook. 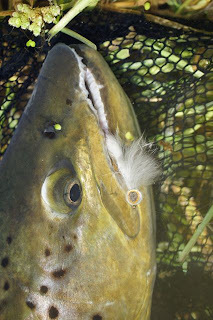 The spinning guys and girls using bubble floats with a Deadly NZ Blowfly tied off it were also doing well along the edges of most lakes. Rapala lures as always seem top work with the pro- spinning guys in every water way. It's been raining heavy for a few days now ! 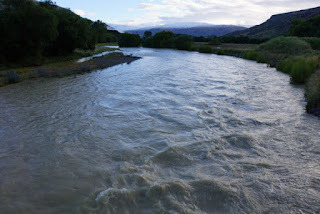 and it's not looking good for most people that want to fish rivers until they clear again in quite a few days - rain depending. Some rivers I'm hearing from travelling fishermen are nearly over the main bridges. It is these floods that help clear the rivers out, but in some cases can help clear the trout out, as the flow is so strong. Checking the forecast, there seems plenty of rain on the way over the next 7 days. Once the rivers descend it will be nymph time again, then once they clear completely the trout will be more readily to rise for dries again. A nz mayfly bomb and a size 18 king pogo with a small indicator above it will no doubt be my go to fish catching rig with clients this week. 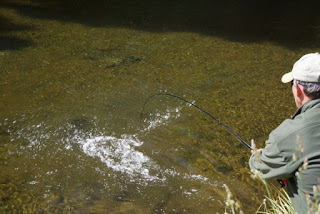 Recently the lower Mataura was on fire in the riffles and under the willow trees, the fish were all lined up. But today two groups of anglers have come into the shop, looking for water to fish as when you stay down the bottom of a long river system. 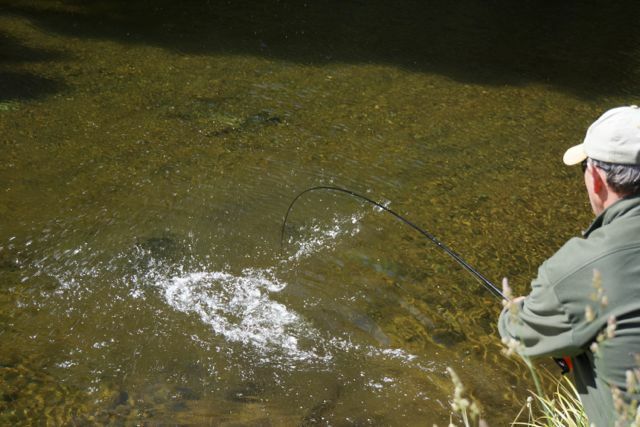 It will take even longer for the water to clear so best keep that in mind when planning any trips, but if you get it right and the weather is all good, it can be fishing on your doorstep from your accom. Armed with a some new waterproof rain jackets from the store, I have now sent them all, into an area which at least has some clear fishable lakes and I'm sure they will have fun, even in the rain. A large attractor black deadly nz cicada fly with a small hot nz midge under it works well in the rain. Try striping some deadly minnows back over weed beds for some good fishing and it also keeps you warm. When fishing deadly minnows I will nearly always tie them directly to the leader. SUPPORT THE HARD WORK AND PASSION - POP IN FOR A BROWSE OR SHOP WITH US ONLINE. - every little bit of your business helps keep the passion and dreams alive. 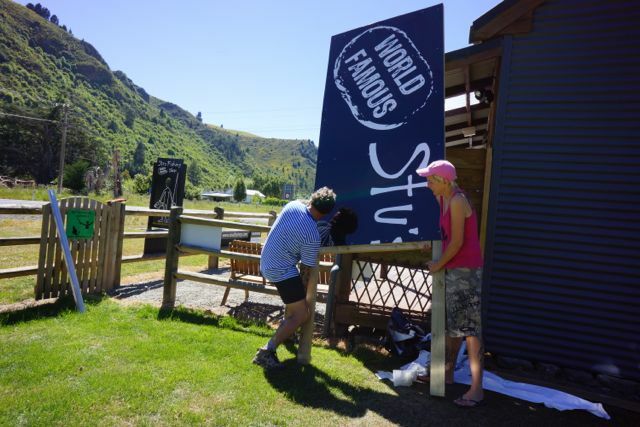 One big single sign - some of of us have to work every day, looking forward to a break in winter - Xmas at the shop.